Matthew “Poki” McCorkle and Ania Upstill are in Palestine for a two-week collaboration with Diyar Theatre. The tour started with workshops for Palestinian clowns. Ania shares their first experience of the workshop. 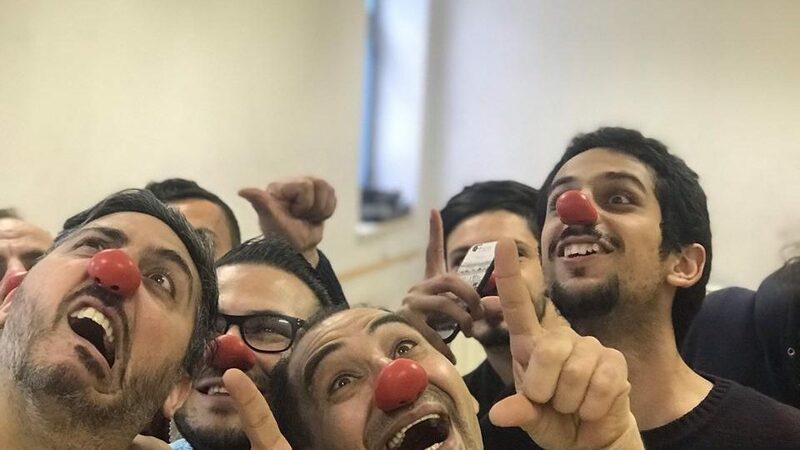 Teaching our first clowning workshop in Palestine is amazing! Rami, from Diyar Theater, is passionate about bringing workshops to some of the many performers in Palestine, and the group he brings today is an absolutely delightful group. From the get-go they’re so willing to play and be silly—it feels like we can provide the container and they fill it with fun. They’re also very fluid in their hips, which you don’t always see from a group of men! When we come to a logical time for a break, in the first section of class, all our students applaud and then say, as if in a chorus, “Now it’s time for a coffee break!” I really appreciate their polite directness. With both of us teachers still on U.S. time, we’re jet-lagged and confused. It’s fascinating to hear about the work these artists do and why they wanted to come to our class. Two of them work together as a puppetry duo. They travel all over Palestine, from Bethlehem to the Bedouin settlements and refugee camps, entertaining children. They show us a photo of the two of them running in the Bethlehem marathon with their puppets in wheelchairs, each puppet carrying a sign that reads: “Look at the human in the chair, not the chair.” It’s inspiring to think how much they travel and how hard they work to bring laughter to children. They’re also hilarious to have in class. During an exercise where the clown comes into the room and discovers an (unknown) object, one of them put himself into the center to be “found.” Hilarity ensued. At the end of the day the artists from Nablus, who drove two hours to get to the workshop, ask if we can do another workshop with them when we take our performance tour to their city. To me, that’s basically the biggest compliment you can receive. Poki and I both agree without hesitation! A last side note: When we buy our groceries at the local market, I make the mistake of choosing an old garlic bulb rather than the new, fresh one. The vendor brings over a fresh garlic bulb for us, and then gives us our two artichokes and the garlic free of charge, saying, “Welcome to Palestine. Enjoy your time here.” If that’s not a beautiful welcome, I don’t know what is!